This incident has been a wake-up call to many young women in Portland, including students of SMA. Just hours before the incident occurred, junior Aditi Jackson, who lives near Grant High School, ran her regular neighborhood loop through Grant Park. The idea of sexual assault seems far off and impossible, but incidents like these remind us that it looms closer to home than we think. Portland was rated the third safest city by Forbes Magazine in 2009. But, in 2010, AOL Travel listed West Burnside Street and Old Town as areas to avoid because of their high rates of crimes, “most involv[ing] disorderly conduct and liquor or drugs.” As SMA is located downtown, the risks of coming across an unstable, drunk, or drug addicted person increase. Most SMA students take comfort in being surrounded by people at all times. Freshman Celine Carlisle says she is not afraid of SMA’s downtown location “because there are a lot of people there, so if anything happened, people would probably see it.” Additionally, she feels safe using public transportation. “There are a lot of girls who are with me so I know I am not alone,” she says. “Not alone” – an important aspect to feeling and staying safe while traveling around downtown Portland. 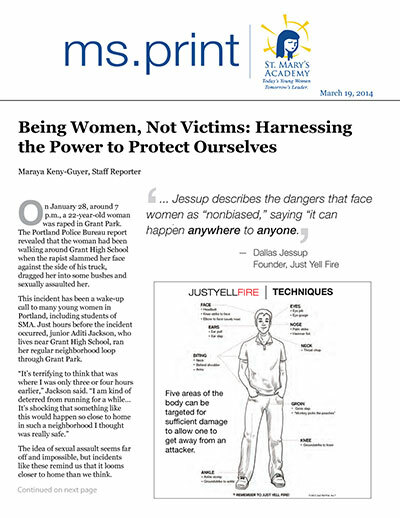 In 2006, SMA alumna Dallas Jessup, ’08, concerned about similar issues, turned a school project into a national campaign called “Just Yell Fire.” It quickly gained momentum, raising awareness and spreading techniques designed to help high school girls keep themselves safe from sexual assault. The program began as a video called “Just Yell Fire” that teaches young women self-defense skills. Jessup soon turned it into an organization dedicated to “empower[ing] girls and young women to know their rights, to stand up for themselves, to be aware of dangers they face (and how to avoid them), and to escape violence when trouble finds them,” according to the “Just Yell Fire” website. SMA girls are fortunate to have a school that places a strong emphasis on safety. In recent years, self-defense lessons have been integrated into the Health 1 and PE classes, covering topics such as how to spot a possible predator and how to stay safe, as well as actual self-defense fighting skills. SMA students have been relatively safe; however, one in five women in the U.S. admitted to being sexually assaulted, according to a survey in the NY Times in 2011. So what can young women do to protect themselves? Knowledge is power. Girls must harness the power to know and protect themselves from possible dangers. It is important to stay in groups, walk in populated areas, avoid being outside past sunset and listen to your gut feelings. “Trust your instincts, your intuition to keep yourself safe,” said former CIA operative Lindsey Moran in an interview for the Chicago Tribune. Additionally, according to a “Just Yell Fire” safety information sheet called “Safety Advice from the Chief of Police,” be aware of your surroundings, walk with confidence, vary your jogging route, jog with others, keep one headphone or earplug out, and in general, stay alert. “Society teaches [women] to be calm, nurturing and caring,” Jessup says, arguing these are great qualities but sometimes lead girls to be quieter or more hesitant. Jessup describes the dangers that face women as “nonbiased,” saying “it can happen anywhere to anyone.” “[Self-defense] is something that a lot of girls have in them, but many do not have the self-confidence within themselves to be able to actually do it,” she continues. But by practicing techniques taught in Jessup’s films and understanding the rights women have, girls can build the self-confidence needed to truly stick up for themselves and fight back when the time comes.